n the first three years of the Modi government, the average agricultural GDP growth in real terms has been just 1.7 per cent. The recent decline in real capital formation, from 18.3 per cent of agri-GDP in 2011-12 to 16.2 per cent in 2014-15 should be a wakeup call for policymakers. Of the ten major themes around which finance minister Arun Jaitley weaved his Union Budget for 2017-18, farmers and the rural population topped the list. Incidentally, he also reiterated Prime Minister Narendra Modi’s and the last Budget’s commitment to double farmers’ income within five years. In this context, let us analyse the key budgetary provisions pertaining to the peasantry and rural folk, apart from safety nets for the poor and the underprivileged, who also figure among the ten listed themes. Our idea is to see how far this is a ‘development’ or a ‘dole’ model Budget. But first doubling of farmers’ income in five years: Jaitley (and Modi) must clarify here (1) whether it is nominal or real incomes that are sought to be doubled and (2) over which base year. The last year for which an income survey of farmers is available is 2012-13. We need to know the level and structure of farmers’ incomes in 2015-16, which can, then, act as a base year to judge the progress of promises from the current fiscal onwards. In the first three years of the Modi government, the average agricultural GDP growth in real terms has been just 1.7 per cent. This does not inspire confidence in doubling farmers’ incomes in five years with business-as-usual policies. The budgets, therefore, should focus on massive infusion of public investment to spur agriculture growth beyond 4 per cent per annum on a sustainable basis. Does this Budget do it? 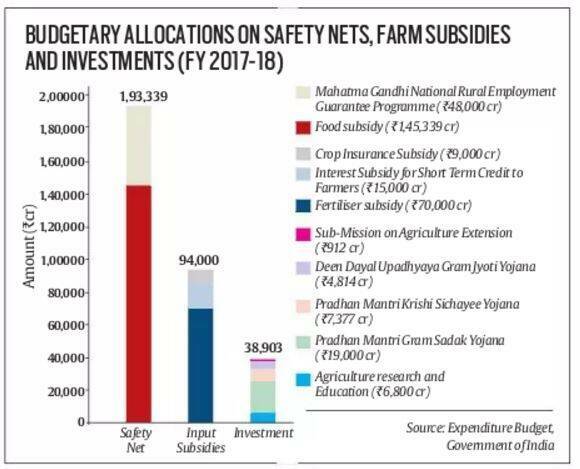 Our calculations show that the largest allocations within the agri, food and rural-related sectors go to food subsidy (Rs 1,45,339 crore) and MGNREGA (Rs 48,000 crore), both essentially safety net programmes ostensibly for the poor. For farmers, the biggest chunk of expenditure is for subsidies on fertiliser (Rs 70,000 crore), credit (Rs 15,000 crore) and crop insurance (Rs 9,000 crore), totalling Rs 94,000 crore. In contrast, the budgetary resources earmarked for investment — though schemes like the Pradhan Mantri Gram Sadak Yojana, Pradhan Mantri Krishi Sinchayee Yojana, Deen Dayal Upadhyaya Gram Jyoti Yojana, the Sub-Mission on Agri-Extension, and farm research and education — add up to only Rs 38,903 crore (see graph). With almost 88 per cent of Budget funds going towards safety nets and farm subsidies, and only 12 per cent for productivity-boosting investments, our policymakers have clearly put the cart before the horse! and medium irrigation projects (Rs 20,000 crore), micro-irrigation (Rs 5,000 crore) and a dairy processing infrastructure corpus (Rs 8,000 crore, starting with Rs 2,000 crore this year) — the overall picture does not change fundamentally. The policy framework remains a ‘dole’ model with an overt ‘pro-consumer’ bias. To be fair, the above framework is a legacy from the UPA regime. But one would have expected this government to have corrected this distortion. While there is some movement toward the ‘development’ model, it isn’t enough to make a significant difference to Indian agriculture or farmers. We raise this issue of ‘dole’ versus ‘development’ models, as our research at ICRIER clearly establishes that the marginal returns — whether in terms of agri-GDP growth or poverty alleviation — are five to 15 times more from investments in agri-R&D, rural roads and irrigation than from spending on, say, fertiliser subsidies. Subsidies and programmes such as MGNREGA, we know, are resource-guzzlers. Their implementation, too, is ridden by inefficiency and corruption. Unfortunately, this Budget has not attempted any fundamental reforms in their operations. The recent decline in real capital formation, from 18.3 per cent of agri-GDP in 2011-12 to 16.2 per cent in 2014-15 should be a wakeup call for policymakers. But forget the Budget, even the latest Economic Survey raises no alarm bells on this account. The target of Rs 10 lakh crore credit for the farm sector in 2017-18 will hardly alter the situation, as about 80 per cent of it would go for short-term crop loans, and not investments. So, the big picture that emerges is that agricultural policy is still heavily ‘dole-based’ and ‘pro-consumer’, even while the farm sector cries for investments. It is high time we realise that a strategy of freebies galore but starving investments will not deliver high and sustainable growth. Agriculture will keep limping and so will be the fate of farmers, unless major structural reforms are undertaken quickly. Better targeting and rationalisation of subsidies can free up resources for much-needed public investment in agriculture. There could be savings of at least Rs 50,000 crore if only food and fertiliser subsidies are routed through direct benefit transfers and leakages get plugged. This money could be diverted toward investments in roads, agri-markets, irrigation, and agri-R&D, which can provide medium to long-term food security and also augment farmers’ incomes. Hope the Modi-Jaitley duo take bolder steps in this direction — may be outside the Budget!